Social media recruiting is on the rise, with 93 percent of organizations now using at least one social channel for talent acquisition. I recently analyzed the latest data and found some of the most popular recruiting content on Facebook, Twitter, and YouTube. Here’s how top brands are engaging job-seekers on social platforms and how you can do the same. One of this week’s best recruiting posts comes from Nestlé Purina. 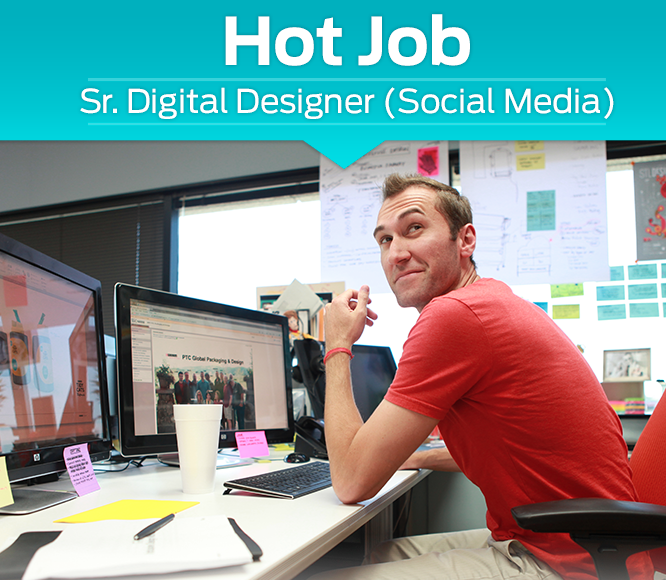 It’s a job listing for senior digital designer, and it includes virtually every social media best practice. It has the job title in big, clear letters. It features a photo of an attractive employee smiling at his desk. There’s a hashtag, #JoinPurina, to guide job-seekers to opportunities on other social channels. The copy below the photo includes, “You’ll work with over 40 national brands and business groups to inspire original and unique social media content,” which sounds rewarding, compelling, and important. At the end, there’s a trackable link to apply. A great post all around, but Nestlé isn’t done yet. One interested woman asked in the comments if a degree was required for the position. She posted at 5:45 p.m., toward the end of the business today. By 11:30 a.m. the next morning, she had a personalized response from a recruiter, who concluded with “Feel free to reach out in any questions!” An inquiry from another job-seeker drew a response in under five hours. The result of all these efforts: 11 comments, 19 shares, and 316 likes. How you can be like Nestlé Purina: This post is more than the sum of its parts. Certainly the photo isn’t anything fancy. A hashtag isn’t revolutionary. There are no elaborate graphics. But this content spoke to job-seekers, giving them something visual, something verbal, something social, and something social. The icing on the cake is the fast, friendly responses to questions in the comments. If you can spend just a little extra time creating your social recruiting content, and a little time monitoring it, you can generate lots of interaction and engagement. It’s great to have the talent acquisition staff reach out to job-seekers with helpful advice. It shows that the company wants them to succeed. The addition of the photo and the recruiter’s name further humanizes what can be an intimidating process. Encouraging candidates to ask questions seems novel; what recruiter wants to be quizzed? Even more impressive, Tina is basically asking candidates to do research on her. Disney is showing that it doesn’t fear scrutiny, a form of transparency that I admire. In just 24 hours, the tweet has four retweets and 17 favorites. 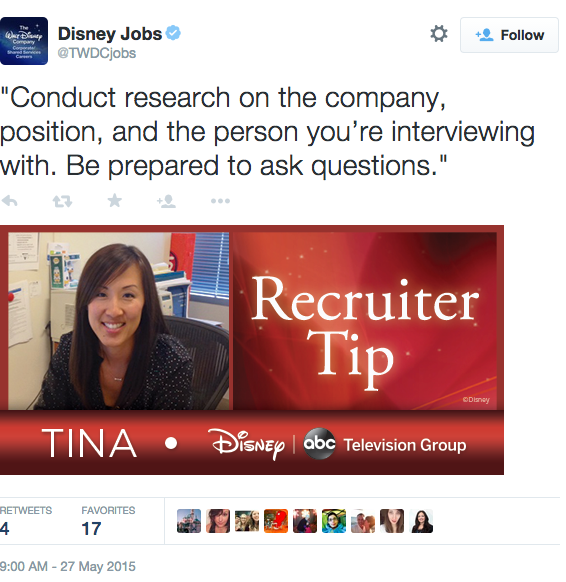 How you can be like Disney: Social recruiting channels have to include more than just job listings. To attract a wider following, organizations have to be a resource for job-seekers. That means offering advice on interviews, applications, and résumés, even though top talent may use that advice to find employment at your competitors. Providing help to job-seekers shows that you care about them and share in their success. A half-hour interview with your recruiter(s) could garner 20 tweets’ worth of advice. Take a photo of the recruiter, add whatever graphics you like, and you can become a popular and well-liked employment resource like Disney. As you know, I’m a big believer in the importance of corporate culture. Many companies mention it or refer to it obliquely in their recruitment advertising, but UnitedHealth Group produced a video that put its culture in the spotlight. The organization’s jobs channel on YouTube saw a huge spike in views over the past week, increasing by more than 60 percent, and “UnitedHealth Group’s United Culture” led the way. The four-and-a-half-minute begins by enumerating its five core values. Then, the company’s top management discuss what each core value means to them. They speak directly to the viewer with only some music and floating words that complement the message instead of distracting from it. Each executive seems comfortable on camera, enthusiastic about the company, and sincere in its convictions. The video has 4,007 views, 11 likes, and zero dislikes. United and several of its employees have also shared the video, and commented about it, on Google Plus. How you can be like United HealthGroup: Highlighting your core values is a great way to solve the recruiting problem of culture fit. Anyone can list them on a website, but having your senior staff, including many in HR and employee communications, look directly at job-seekers and tell them about a company’s mission and vision is an powerful statement. A video isn’t too hard to create, but if it is, a photo and a written testimonial from the relevant executives will work. At the very list, put your organization’s values front and center on your recruitment materials and your careers site, to show what you stand for and to attract like-minded employees.